For detailed information on the individual Channel Islands, see Appendix 12 of the Regional Strategy 2018. The Channel Islands are a chain of eight islands located off the coast of Southern California along the Santa Barbara Channel. The Islands are a unique feature of Southern California and are home to many endemic, rare and endangered species. Several of the Channel Islands have wetlands, and this section provides a sense of those resources. A future initiative for the WRP is to map and quantify the wetlands across the Islands, and create quantitative objectives to help guide their restoration and management (see Goal 4 of the Regional Strategy 2018). 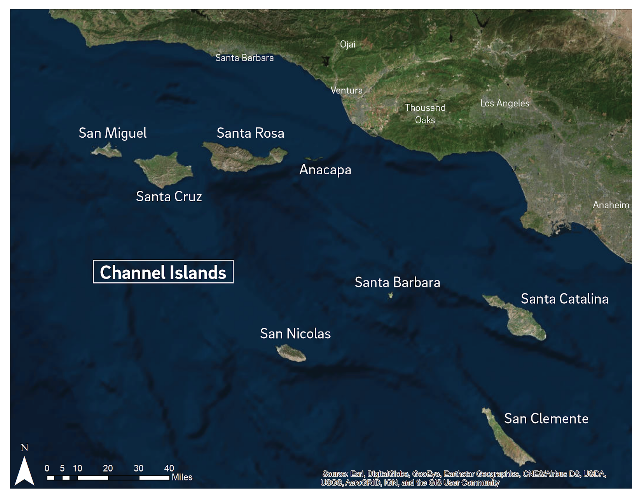 Five of the Islands (San Miguel, Santa Rosa, Santa Cruz, Anacapa, and Santa Barbara) are part of Channel Islands National Park, and the waters surrounding these islands make up Channel Islands National Marine Sanctuary. Two islands (San Nicolas and San Clemente) are owned by the U.S. Navy. Eighty-eight percent of Santa Catalina Island is owned by the Catalina Island Conservancy. The Channel Islands (Islands) and the surrounding waters house a diverse ecosystem with many endemic species and subspecies. The Islands have a combined land area that is approximately half the size of Orange County. Wetland resources on the Islands are unique in that they are protected from many of the threats facing wetland resources on the mainland, namely urbanization and its associated impacts, as well as new non-native species invasions. Moreover, the Islands are the only offshore locations for migratory shore and seabirds in the region. Protection of wetlands on the Channel Islands should be a high priority to support the diversity of wetland types, functions and habitats in the region.